Leader of the Indigenous People of Biafra, IPOB, and Director of Radio Biafra, Mr. Nnamdi Kanu has threatened that he would expose secrets that are capable of sinking Nigeria. Kanu gave the threat at his resumed trial on Tuesday. Justice Nyako who held that names of all the prosecution witnesses who are mostly security operatives, would not be disclosed in any record of the court proceedings also said that the witnesses would be allowed to testify against the defendants behind a screen that would be provided by the court. Justice Nyako however stressed that both the defendants and their counsel would be allowed to see the witnesses who she said would enter and exit the courtroom through a special door. However, Kanu immediately rejected the court ruling, insisting that it was against the tenets of Justice and fair hearing. “I won’t stand this travesty of Justice. Buhari spoke in public, he accused me in public. I must also be allowed to stand my trial in public”, Kanu bellowed from the dock. “This is nonsense! I will give testimony before this court! By the time I finish, there will be no Nigeria. This is no Sharia court. It is a court that operates under the common law. “There will be no screening of witnesses, no fake identities or fake addresses. I cannot be tried in secret. No! 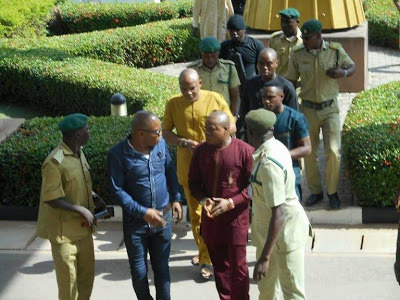 Nnamdi Kanu cannot be jailed in secret! They are mad. Why must I be tried in secrecy by a government that does not obey court orders. “They are killing my people in public, after killing my people they want to try me in private? That person is mad. I won’t allow it. “, Kanu fumed. The IPOB leader is facing an11-count charge alongside three other pro-Biafra agitators, Mr. Chidiebere Onwudiwe, Benjamin Madubugwu and David Nwawuisi.